A change in the forecast for today ended up resulting in a change of plans. Yesterday we traveled north to South Dakota to get into place for today’s severe weather threat. However, later model runs yesterday evening and into this morning showed northeastern Colorado becoming a more favorable target. Eastern South Dakota appeared to have more favorable ingredients for supporting severe thunderstorms for today. Storms, however, weren’t expected to begin initiating until later on in the day after these favorable ingredients had virtually disappeared. Since the favorable ingredients for supporting severe thunderstorms would decrease throughout the late afternoon/early evening hours, strong storms would not survive long in this environment. Modeled reflectivity showed storms initiating late afternoon in eastern South Dakota and quickly dying due to the lack of these necessary ingredients. Northeastern Colorado was the opposite. 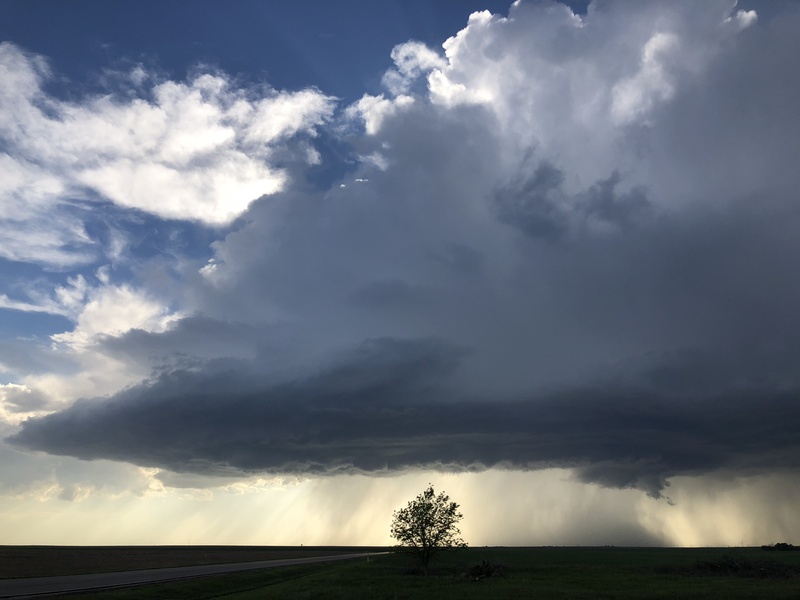 Northeastern Colorado was expected to start off lacking ingredients necessary for supporting severe storms but would gain them later on in the day. This environment was expected to be favorable for producing supercells. 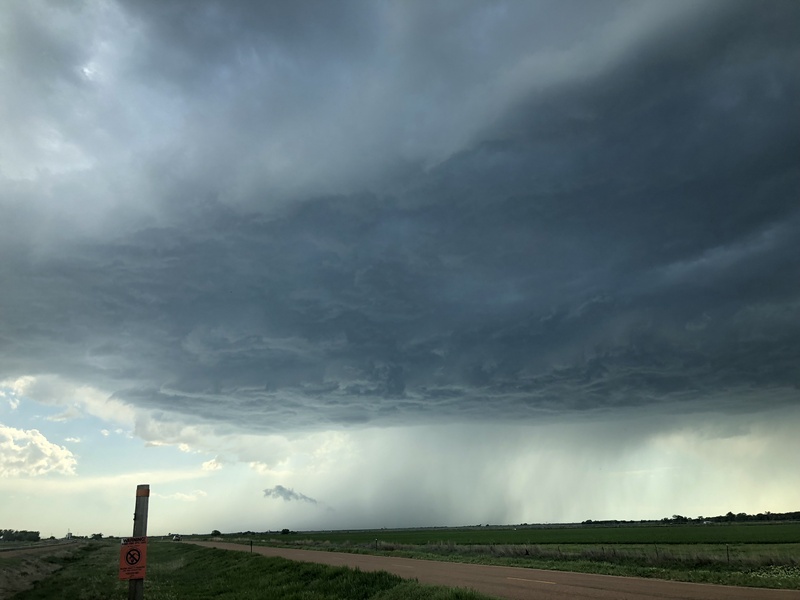 Since we were in South Dakota, we had to make our way down to northeastern Colorado as soon as possible in order to make it in time for any storms that would fire up. We made our way down to Fort Morgan, Colorado where we stopped at a local park for about an hour, waiting for storms to initiate. As storms began to fire up in northeastern Colorado, we headed northeast to stay ahead of them. These storms started off as high based storms and maintained the same intensity for an extended amount of time. High based storm near Crook, CO.
After awhile, the storm we were chasing began to intensify more and become better organized. This storm developed a very nice supercell structure as it moved into a more favorable environment. Rotation within this storm could be seen but never was able to produce a tornado. Supercell becoming better organized near Big Springs, NE. The storm became a beautiful HP supercell as it moved northeast into southwestern Nebraska. We experienced approximately 40mph wind gusts from the storm’s RFD as we watched it. Storm strengthening into a beautiful HP supercell near Lemoyne, NE. This storm put down plenty of hail as it moved through. Roads became covered with hail at some points while we were driving. This hail was approximately pea to marble size. We didn’t observe anything larger than that. 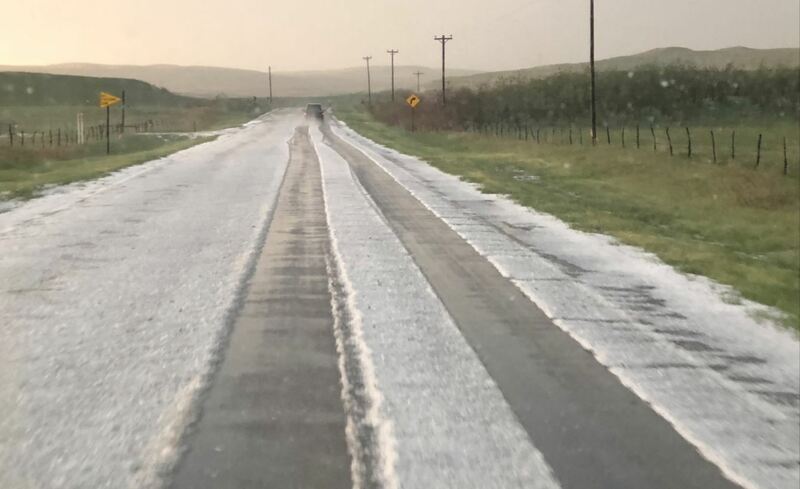 Hail covered roads near Author, NE. After a long day of chasing, we ended the day in North Platte, Nebraska. Today’s supercell turned out to be one of the most beautiful storms we have seen on this trip! This entry was posted in Kentucky Weather and tagged Colorado, nebraska, Storm Chase. Bookmark the permalink.